If I had a choice, I would take Brad to Color Me Mine (a pottery painting studio) way too often. Have either of you been? It's the best time: nice tunes, a relaxing activity, and and opportunity to expand your creativity. We've done it several times, and each time we get a bit better. We've learned to keep it simple. 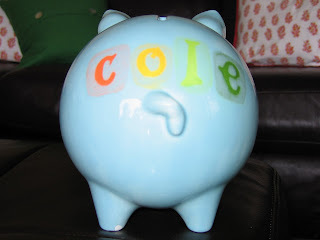 So far, our successful projects have been: soup bowls, a chip and dip platter and a piggy bank for Cole. 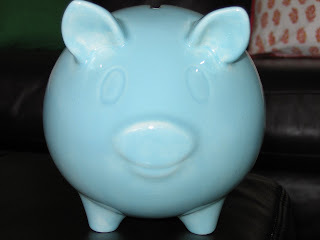 Here's how it works: pay a standard "studio fee", choose the piece you want to paint (there is always quite a variety of pottery and price ranges), paint/decorate your pottery (all paint and supplies provided), and pick it up several days later, fired, glazed and ready to take home. Lindsey, they do have one in London! If anybody is interested, go to http://www.colormemine.com/ to find a studio near you. Cool! I've always seen the shops, but have never done it. I love the idea of soup bowls. So, you paint them and then they will glaze them? Sounds the perfect deal to me. I've always wanted to do this! I think they have a shop in the Riverside shopping area in Provo?? Anyway, I know where one is. I'm going to look it up right now. I need to do this. Thanks.